East Bend Animal Hospital is proud to be one of a few clinics in Oregon to offer Class IV high intensity laser therapy. Lasers are not new. Class III therapy lasers were first approved by the FDA in the United States in 2002. Class IV lasers received FDA approval in the United States in 2005, but have been used in Europe for much longer. 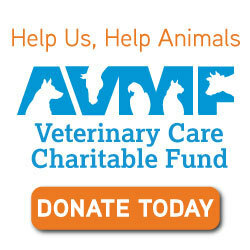 Acceptance has been rapid in human rehabilitation and is slowly on the rise in veterinary medicine. Class IV laser therapy is the use of an intense beam of laser light directed into tissues to reduce pain, increase blood flow, decrease inflammation and promote healing. Unlike previously available Class III cold laser units (power of 500 milliwatts or less), our new laser is capable of producing 12,000 milliwatts (24 times more powerful). This allows us to provide therapy to deep tissues around the hips, shoulders and spine in much less time. No matter what kind of pet you have, large or small, exotic or domestic, laser therapy can be part or the solution to help ease your pet’s pain. Safe and effective, this powerful modality provides increased mobility, increased wound healing, bactericidal activity and post surgery rehabilitation. Laser Therapy is also a great option for cats! Cats are very sensitive to medication and do not have the same options as dogs when it comes to pain relievers and anti-inflammatory medications. 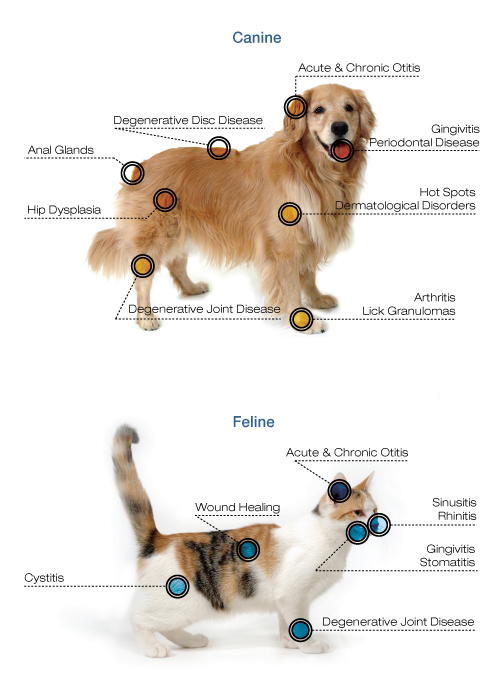 Cats that have a joint injury or arthritic pain in their backs can be successfully treated with Laser Therapy. Photobiomodulation and Photobiostimulation are the scientific terms for Laser’s effect on tissue. Deep-penetrating photons from the laser influence cell chemistry in a variety of beneficial ways. In addition, the infrared wavelengths create a warm sensation in your pet’s body at the precise location requiring treatment. Treatment time, power and laser pulse frequency are based on your pet’s individual condition and body size. Although improvement is often seen after the first visit, most patients require several treatments (3 to 8) for greatest benefit. For most conditions, we recommend a multi-visit treatment plan. Treatments vary in length, but most sites require 2 to 8 minutes. A majority of patients exhibit greater comfort and mobility within 12 to 24 hours after a laser treatment. Faster Wound Healing. Laser light stimulates fibroblast development [fibroblasts are the building blocks of collagen, which is predominant in wound healing] in damaged tissue. Collagen is the essential protein required to replace old tissue or to repair tissue injuries. As a result, laser therapy is effective on open wounds and burns. Anti-Inflammation. Laser light therapy has an anti-edemic effect as it causes vasodilation, but also because it activates the lymphatic drainage system [drains swollen areas]. As a result, there is a reduction in swelling caused by bruising or inflammation. Immunoregulation. Laser light has a direct effect on immunity status by stimulation of immunoglobulins and lymphocytes. Laser therapy is absorbed by chromophones that react to laser light. The enzyme flavomononucleotide is activated and starts the production of ATP [adenosine-tri-phosphate], which is the major carrier of cell energy and the energy source for all chemical reactions in the cells.